The word "passion" is linked so often with soccer as to be a chunder-inducing cliche. But there's truth to it, as was so clear when I attended the River/Colon game a few weeks back. 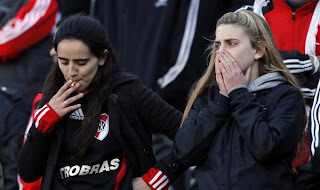 There's a nearly insane edge to the intensity of the hinchas' love for their River Plate,* as there is between so many supporters' groups and their soccer teams. I mentioned in that post that River was struggling this season, and indeed they did struggle throughout June. So much so, in fact, that they ended up being one of the worst teams in the entire Argentine league, which meant that they had to play a team from the second division to stave off relegation. (NB: Outside the US, soccer leagues are characterized by a feature called relegation and promotion, whereby teams that finish last or nearly last in their league can be sent down (relegated) to the division below. Similarly, teams that finish high in their league can be sent up (promoted) to the division above. In this manner, even teams from the lowest professional leagues have a theoretical (albeit distant) chance to rise up through the ranks and find themselves shoulder-to-shoulder with top teams. However strange this may seem to Americans, foreigners (at least the Argentines I've spoken to about it) express shock and dismay when told that our professional teams don't have a relegation/promotion structure. It's not really even possible in the US, where there's either only one league (NFL) or there are minor leagues but they exist as part of pro clubs to develop talent (MLB)). So. Turns out that River Plate was not automatically relegated to the second division, but was put in a position where they had to play a two-game playoff against a 2d tier team called Belgrano (from Cordoba, not to be confused with the Belgrano district of Bs As, which is actually and somewhat ironically where River's stadium, el Monumental, is located). The winner of the two-game, total-goals series would play in the primera, the loser would be stuck in the segunda. Got that? More simply, let's put it this way: If River didn't beat Belgrano, they'd be required to spend the next season (at least) in the Argentine equivalent of the minor leagues. It's hard to overstate the impact of this on a massive club like River. Not only would it mean they'd be getting less money and fan support and playing against a lower level of competition, but it would also be a profound humiliation. Consider, for example, if the NY Yankees had to play in Triple-A ball after having a bad season. One Spanish team that got relegated tried to sell fans on its upcoming trek through the lower division with an ad campaign called "Come join us for a season in hell," which about sums it up. So in the first game of its promotion/relegation playoff up in Cordoba, Belgrano drubbed River 2-0, a performance so bad that some River fans broke through the security and attacked some River players. Not a good omen. This set up a desperate situation whereby River needed to beat Belgrano in the return leg here in Buenos Aires on Sunday by at least two goals to save themselves from relegation. The game was just about all anyone was talking about for the intervening days, even people who didn't care about soccer. My Spanish teacher, an Uruguayan lady who professed a great distaste for the game, came into our class on Thursday and asked, "Did you see what's happening to River?" in the same way one might ask about an awful political or cultural event (e.g., "Did you see that famous person X is in the hospital?"). The game happened yesterday, and I happened to catch the second half in a pizza restaurant that is far from a sports venue in terms of clientele and atmosphere. Still, the one TV was faithfully tuned to the game, and the (mostly old) people there were all watching rather than talking to each other. The mood was somber, as though everyone was watching, say, a state funeral or something grimly fascinating. But there was hopeful news; River led 1-0 at the half, and another goal would secure their place in the Primera (barely). Then, only about 15min into the second half, Belgrano broke on a counterattack and scored a really well-worked goal, the forward diving feet-first through the air to stab the ball into the back of the net. The goal meant that River was just about done, needing to score three goals (for complex reasons I won't get into). The assembled crowd reacted in horror--there were shouts of dismay, and averted eyes, as though we'd all witnessed a gruesome traffic accident. And I say "we" because I absolutely felt this too, to my enormous surprise. It was as though I'd absorbed the desire (that I think was shared by all of Bs As) not to see River humiliated. But they were. They won a penalty, but Caruso missed it, and when he looked skyward in anguish after, you sort of knew that was it for River. The game ended 1-1, and River was relegated to the Segunda for the first time in its 110-year history. What happened immediately after? Crying. Crying and crying and crying. 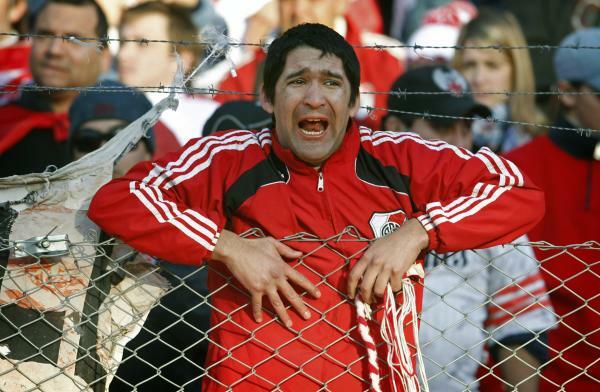 [Insert "Don't Cry for Me, River Plate" joke here.] The River fans cried; the River players cried. The Belgrano fans cried (with joy); the Belgrano players did too. I have never seen so much crying in a professional football stadium. And this was not, to be clear, the kind of awful, treacly American crying that is a product of flabby sentimentality (and which is well illustrated by this documentary, which is the soggiest most lachrymose film I've seen in my life, and which turns my stomach; cf. also John Boehner). This was a more Latin crying, both more demonstrative and more openly anguished. It was "I can't bear this suffering" crying, not "gee, I feel sentimental crying." The undercurrent wasn't merely sadness or disappointment, it was rage. Oh, and did I mention rage? Because then? There were totally, totally riots. It began with violence inside the stadium. The ref didn't end up using the available extra time in order to get the players off the field. And when they did finally come off the field, they had to do so through a hail of ripped-up seats that the fans rained down on them. 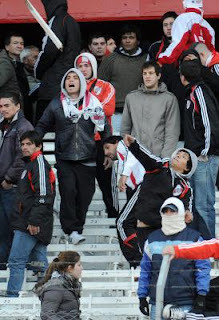 The Belgrano fans had to be kept in the stadium, hidden away to avoid being a target of violence. And then after the game, for like hours, there was violence against police, reporters, and other fans outside el Monumental. I watched the coverage with mixed emotions--freaked out that there were soccer riots happening a couple miles from my depto, and pleased that I could understand everything the news announcer was saying. The fact of riots after a sports disappointment is not new. Vancouver just rioted over their game-seven loss to the Bruins in the Stanley Cup, and there are often low- to mid-level civic disturbances following wins (oddly enough) in the US, such as Detroit (NBA Championship 2004) and also wherever UConn is (NCAA Championship 2003? ), just to name a couple examples. The difference, though, is that while Vancouverians or whoever will get over their loss and continue to play in the same league, River's relegation puts them into a lower world of soccer altogether. And it's also been regarded as somewhat of a national tragedy. Very few people, even Boca fans, wanted to see River relegated (though certainly some Boca fans are basking in schadenfreude). It's sort of like if something awful like a serious accident happened to an iconic but divisive public figure--if you loved the guy it would be heartbreaking, but even if you hated him it would be tragic and terrible to see him suffering. But suffering is, I suppose, a necessary incident of passion. For all the excessive number of times "passion" is invoked in connection with the soccer, it's paired with scenes of cheering fans and exulting, goal-scoring forwards. Here, though, the passion is seen in its opposite number, which is obviously the gut-wrenching pain and sadness of a hideously disappointing (and franchise-threatening) loss. And for DF, it was interesting observationalistically, because I do not have a dog in this particular fight, but despite that felt sucked into the whole drama, somehow by the force of the entire city's being fixated on the event in that distinctive "can't avert eyes from unfolding gruesome tragedy" sort of way. It was about as Porteno as I've felt during my time here. *Possibly interesting cultural note: You'll notice by this point in your careful scrutiny of el blog that Argentinian soccer teams tend to have Anglicized names. E.g., River Plate (not "Rio de la Plata"), Boca Juniors (half-Spanish, I guess), Racing Club, Newell's Old Boys (referring to the club's founder, a Brit named "Newell" presumably, and "Old Boys" indicating something like "alumni"), and All Boys (no idea what this means, though it sounds kind of pervy, and I think may refer to the single-gender character of the schools in Arg). This is, I'm told, because when Brits came to Argentina in great numbers in the late 1800s-early 1900s, they also brought soccer with them, and named the clubs that still exist. The slightly funny feature of this is that the locals pronounce the English names of the teams with Spanish inflections (e.g., "River" = "Rrreeber" or "Racing" = "Rrrahsing"). I find myself referring to River as Reeber even when I'm talking about the team in English.